Fluke Calibration introduced today two best-in-class digital multimeters, the 8588A and the 8558A 8.5-Digit Multimeters. These long-scale precision digital multimeters offer superior accuracy and long-term stability over a wide measurement range. The 8588A Reference Multimeter is the world’s most stable digitizing multimeter. Designed for calibration standards laboratories, this reliable digital multimeter holds the industry’s best one-year dc voltage accuracy and pushes the speed envelope by producing a stable 8.5 digits reading in a mere one second, enabling it to outperform any other long-scale reference multimeter on the market. With more than 12 functions, the 8588A helps consolidate a lab’s cost of test into a single measurement instrument. The 8558A 8.5-Digit Multimeter digitizes five million readings per second, the industry’s fastest, for high-resolution system automation in calibration labs and manufacturing test environments. It further supports a minimum of 100,000 readings per second at 4.5 digits across GPIB, USBTMC or Ethernet, and a 15 million reading data storage in the instrument memory, allowing full flexibility to make timely and correction decisions for system throughput and efficiency. These instruments offer a straightforward, intuitive user interface and color display with an easy-to-access configuration menu that makes it easy to train new users. A graphical display allows easy visualization of trends, histograms, complex waveforms, and statistics. Repeatable system-specific tasks can be automated quickly and easily. Fast, high-resolution data capture delivers the quantity and quality of information needed for increased productivity and faster access to results and answers. The 8588A and 8558A work with Fluke Calibration MET/CAL™ Calibration Software, in 8508A emulation mode, allowing increased throughput while ensuring calibrations are performed consistently every time. This powerful software documents calibration procedures, processes and results for ease in complying with ISO 17025 and similar quality standards. To learn more about the 8588A Reference Multimeter visit: http://www.flukecal.com/8588A. To learn more about the 8558A 8.5-Digit Multimeter visit: http://www.flukecal.com/8558A. 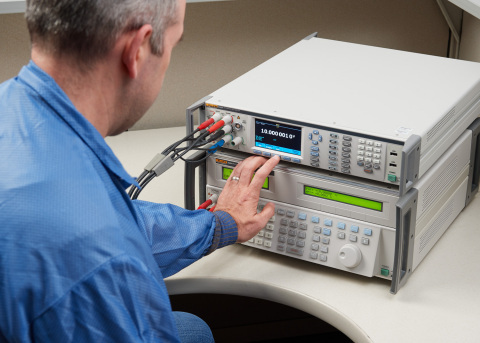 Fluke Corporation is a leader in precision calibration instrumentation and software for electrical, temperature, humidity, pressure, flow, and RF measurements. Fluke Calibration products from Fluke Corporation are found in calibration facilities around the world, including National Metrology Institutes, that demand the highest levels of performance and reliability, backed by state-of-the-art metrology and uncompromising support. They are relied on by quality engineers, calibration technicians, and metrologists to instill confidence in the measurements that are critical to their organizations for quality, safety, reliability, and cost.